How The CIA Found A Soviet Sub — Without The Soviets Knowing : Parallels It's a great tale of Cold War intrigue that includes eccentric billionaire Howard Hughes, a CIA covert operation and a Soviet sub with nuclear missiles that sank to the bottom of the Pacific Ocean. The Hughes Glomar Explorer off the coast of Catalina Island, Calif., in August 1975, a year after its secret CIA mission to raise a Soviet sub that sank in the Pacific Ocean. This was one of the CIA's most elaborate and expensive operations. The CIA has just declassified new documents that show the Soviets were suspicious, but never actually knew what the Americans were doing. The CIA has a favorite phrase: "We can neither confirm nor deny." 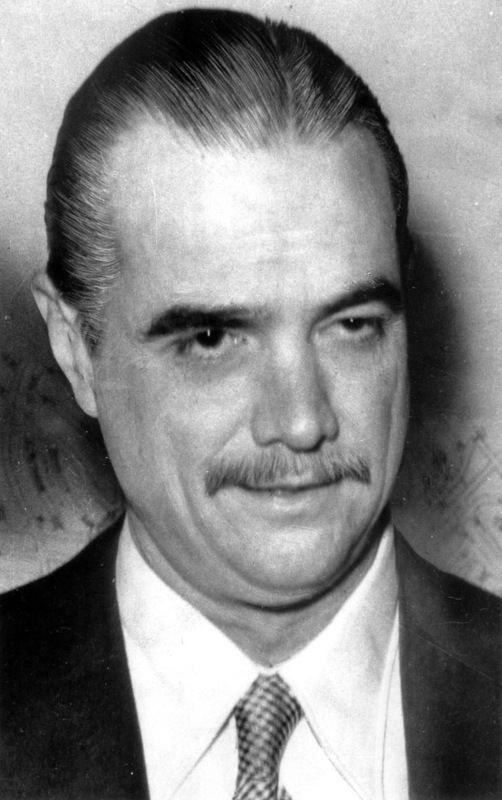 It was born as part of a strange Cold War drama, involving Howard Hughes, that now has a new twist. Back in March 1968, a Soviet submarine and its nuclear missiles suffered a catastrophic accident and sank to the dark, chilly floor of the Pacific. All 98 sailors died. The Soviets sent out a huge search party, but after two months of looking, finally gave up. The ocean was just too big, and the sub was more than 3 miles below the surface. But from the U.S. perspective, this was a potential intelligence gold mine just sitting there. And the U.S. had a huge advantage. Howard Hughes, an eccentric, reclusive billionaire, agreed to be the cover story for the CIA plot to retrieve the Soviet sub. He announced that he would build a huge ship to mine valuable manganese nodules from the floor of the Pacific Ocean. In reality, the CIA was working with Hughes to build a one-of-a-kind ship to raise the sunken sub. The U.S. Navy and the Air Force both had sophisticated acoustic listening devices throughout the Pacific. Both systems picked up something strange from the sub's accident, and they compared notes. "Someone had the brains in the Navy to say, well let's talk to the Air Force. Turns out, they could pinpoint the noise to a certain area," said naval historian Norman Polmar. He co-wrote a book on this episode, Project Azorian: The CIA and the Raising of the K-129. Project Azorian was the CIA's name for its secret operation to find — and raise — the sub, which was known as the K-129. The Soviets believed — falsely — that an American sub had collided with their sub, known as the K-129, causing it to go down. This much and more has long been known. But newly released CIA documents show the Soviets also believed — falsely — that the U.S. would never be able to locate or recover the sub. The CIA doesn't reveal its sources. But the documents show that the Soviet Navy concluded in 1970 that "it was hardly worth fearing the Americans would raise the submarine. First of all, they still did not have appropriate equipment. Secondly, the submarine still had to be discovered in the seabed, which at that depth ... was oh so difficult." No U.S. sub could actually go that deep. But an American sub, the Halibut, dropped a sled with a camera and was able to take thousands of photos of the Soviet sub, showing it was still largely intact. But how do you raise a 2,000-ton Soviet sub without anyone noticing? That's where Hughes comes in. Hughes, an eccentric, reclusive billionaire, agreed to be the CIA's cover story. He played along with the plan concocted by the agency, announcing that he would build a huge ship to mine valuable manganese nodules from the seafloor. In reality, this one-of-a-kind ship had a submersible vehicle with a huge claw to pluck the Soviet sub from its watery grave. "By choosing someone who was so well known, it was a great cover story, because no one could believe it was a cover story," Polmar said. But the project was neither cheap nor quick. It took hundreds of millions of dollars and six years before the Hughes Glomar Explorer set off from Long Beach, Calif., in June 1974. The cover story was still holding tight in the U.S. But the Soviets were clearly suspicious. Sherman Wetmore, now 82, was an engineer on the ship. He says a Soviet vessel, later replaced by a second one, shadowed the Americans as they anchored above the Soviet sub. There was even a helicopter circling above that, taking photos. "They watched everything we did, and the cover story was still holding," Wetmore said. 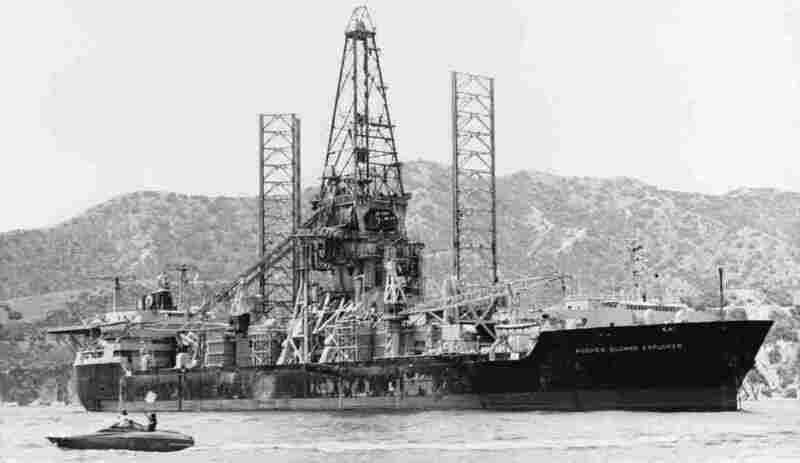 The Hughes Glomar Explorer needed some two weeks to deploy its submersible vehicle 3 miles and clamp the giant claw onto the Soviet sub. It was a remarkable feat of maritime engineering that had never been tried before, and no one was sure it would work. But after a few hiccups, it did. The Soviet sub was raised more than a mile over the course of several days, though it still had 2 miles to go. Then suddenly, the Hughes Glomar Explorer shook. "If you've ever been in a little earthquake in California, it felt like that for probably 10 seconds," Wetmore said. "You knew it was something serious." The sub had broken apart — and most of it headed back to the bottom. The CIA would have to settle for about 40 feet of a sub more than 300 feet long. Yet those Soviet ships never figured out exactly what they were witnessing. Wetmore said the plan was to bring the sub onto the ship at night in hopes the Soviets wouldn't notice. But as the sub was approaching the surface, the Soviet boat "blew their whistle three times, which is a symbol of 'see you later,' 'farewell,' and they left," Wetmore said. Shortly afterward, the remnants of the sub were brought aboard the Hughes Glomar Explorer. The ship then headed to Hawaii. The entire journey lasted just over two months. So what did the CIA find? Two nuclear-tipped torpedoes and some submarine manuals. Very interesting stuff, though not the intelligence windfall that was hoped for. The operation began leaking out six months later, with a series of U.S. media reports in early 1975. Rolling Stone magazine filed a Freedom of Information Act seeking more details. The CIA still didn't want to confirm the operation, but, well, it could no longer deny it. Hence the phrase, "We can neither confirm nor deny." The Soviet ambassador to Washington, Anatoly Dobrynin, demanded an answer from U.S. Secretary of State Henry Kissinger. The CIA documents, citing Soviet officials, say Kissinger "essentially admitted partial success." After the Cold War, in 1992, the U.S. gave Russia a video showing the Americans on the ship respectfully burying at sea the remains of six Soviet sailors found in the sub. The Americans on the Hughes Glomar Explorer buried at sea the remains of six Soviet sailors found in the K-129 submarine. This video of the ceremony was given to the Russians in 1992, after the Cold War ended. A half-century after the mission, Polmar still thinks it was worth it. "The CIA, over a six-year period, did a phenomenal job of building the salvage capability to pick up a submarine, from 16,000 feet, in the middle of the Pacific Ocean, with the Soviet Navy watching them, and the Soviets had no idea what was going on," he said. The Hughes Glomar Explorer lived out its maritime life drilling for oil in the deep sea. It went to the scrap heap two years ago, a victim of low oil prices. When the CIA took to Twitter in 2014, it began with this: "We can neither confirm nor deny that this is our first tweet."